Jake Jensen (Naish) has just taken out the 2012 “20 Beaches Classic” SUP race in Sydney. The young Queenslander put in an amazing performance in the tricky conditions, finishing the 25km course in a time of 2 hours 14 minutes. Local guns Dave Kissane and Sam Parker (both paddling Starboards) were a couple of minutes behind Jake, while Fanatic rider Paul Jackson took fourth ahead of a burnt out Travis Grant (NSP). First female over the line was Neelie Brown, who finished in just under 3 hrs. 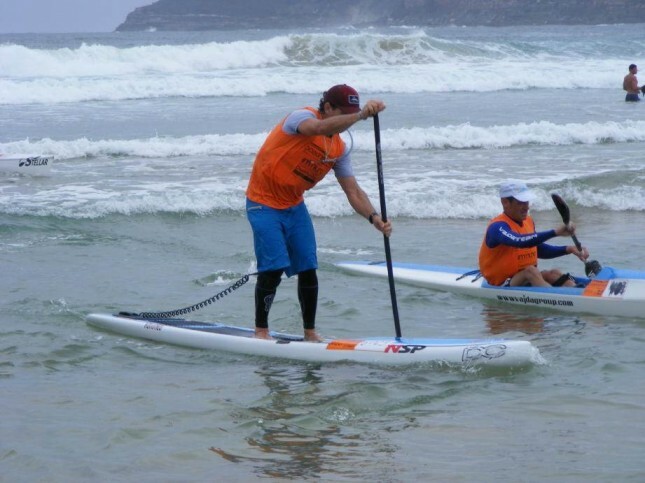 The 20 Beaches Classic has become one of the top SUP races in Australia and this year attracted many of the country’s finest downwind paddlers. Competitors were lured with the promise of stellar downwind conditions from Palm Beach, in Sydney’s North, down to Freshwater Beach. The wind gods didn’t follow the script though, as paddlers were instead greeted with a light North Easterly seabreeze that made conditions difficult. 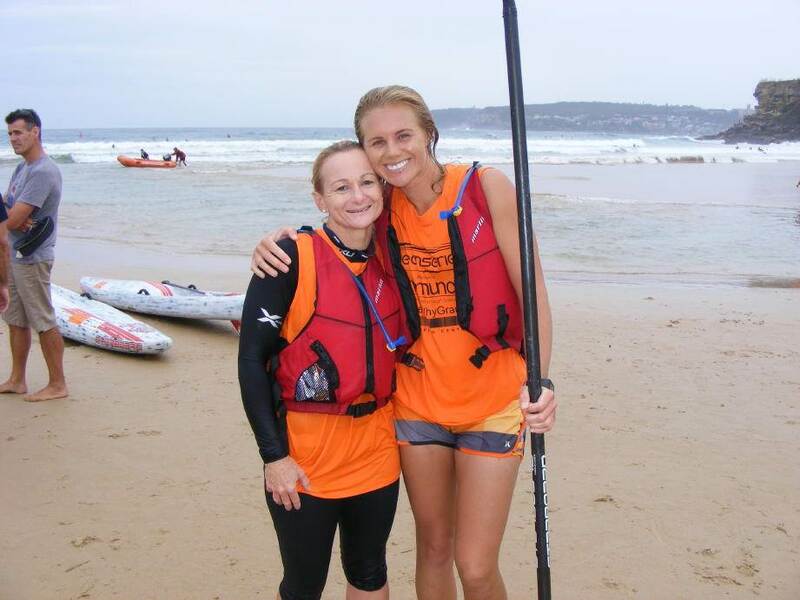 The race started 200m off the beach, which was a smart decision by race organisers as some paddlers took 10-15 minutes to get through the heavy shore-break. 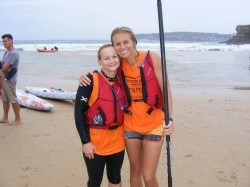 From the start it was a straight paddle out for a good 600-700 metres, round a buoy, and then South. The first 3-4 kilometres were the trickiest; the steep cliffs and deep water of Sydney’s far Northern Beaches produced endless backwash, sidewash and rough water. No matter how far out we paddled, it seemed impossible to escape the chop. The top 10 guys took off and immediately put in a solid gap on the rest of the field, which would stay in place to the finish. At the pointy end the race was being led by the favourites: Dave Kissane, Travis Grant, Sam Parker, Jake Jensen, Paul Jackson and Steve Morrison. After the first 4-5 kms were done we rounded a headline and suddenly conditions improved dramatically. The sidewash all but disappeared and we finally started catching some fun little runners. I was locked in a personal battle with Steve “The Wild Man” Walker and also had to contend with a handful of plucky locals who were proving impossible to drop. By the mid part of the race those of us in positions 11th-15th had all but lost sight of the leaders. We also started to get overtaken by the surf skis that had started 30 minutes behind us. Despite the light winds I managed a few good glides to help me put some distance into Steveo (who was struggling to stay upright in the chop on his super narrow board). The 20 Beaches course is quite spectacular. 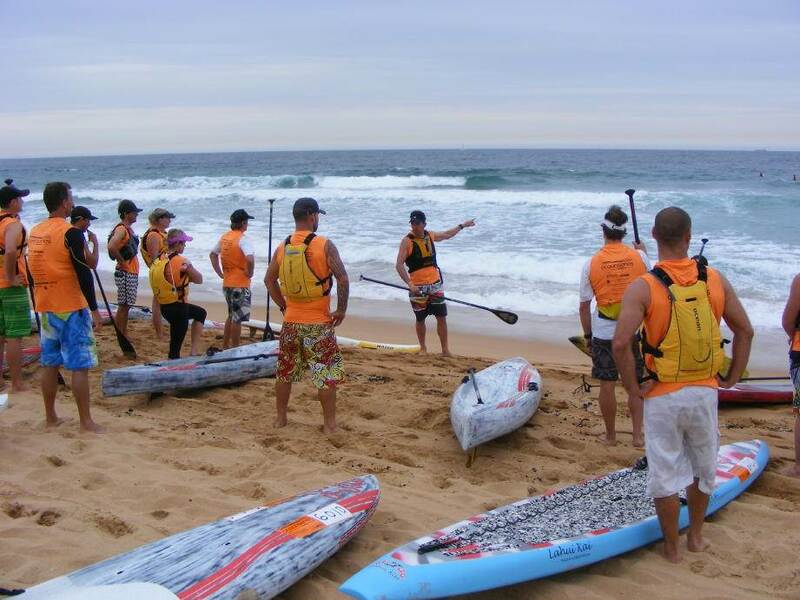 The event carries the name for a reason; you pass 20 different beaches between Palm Beach and Freshwater, as well as a dozen or so spectacular headlands and plenty of awesome coastal scenery. We didn’t have a whole lot of time to enjoy the view though; there was plenty of pride on the line even for those outside the Top 10 and we had to make the most of every bump we could get. There was also the small matter of deciding where we were actually going… 25 kilometres is a long way and for someone who’s never stepped foot in this part of the country, the whole coastline started looking similar. I had no idea where (or how far away) the finish line was. At one point I was angling towards a headline that I would later find out was Sydney Heads (the entrance to Sydney Harbour, quite a ways South of where we were supposed to finish). 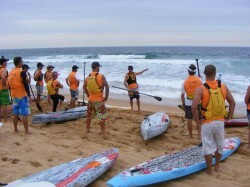 Eventually I saw all the surf skis turn back in towards the coast and towards our eventual finish at Freshwater. After sipping the final drops from my water pack, I managed to catch a few bumps and then a wave into the shore at Freshwater Beach. After 25kms my shoulders were dead and my arms had started cramping up, but I was stoked to have beaten Steveo. I could have finished second last and I still would have been happy just so long as I was in front of the big guy! At the finish line I found out that the lead bunch had been pretty even right up until around the 20km mark, when Jake Jensen took off and somehow put a couple of minutes into the other leaders. Travis Grant had been keeping pace with local guns Dave Kissane and Sam Parker, but hit the wall with a few kilometres to go and practically stopped dead in the water. Travis was overtaken by Jacko and then barely hung on to his top 5 spot. Jake’s performance was pretty amazing. The locals Kissane and Parker had plenty of local knowledge and would have been tipped by many to finish one-two. There was also the small matter of World Champion Travis Grant being in the field, a guy who is almost unbeatable in downwinders. 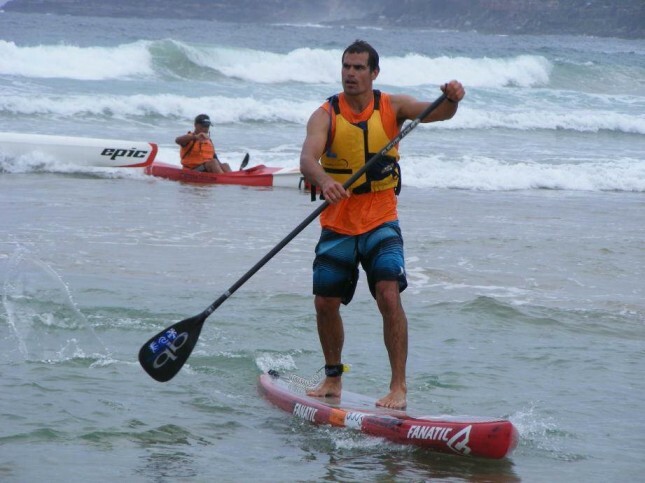 However in his return to SUP racing the new NSP team rider pushed himself too far and paid the price. Trav is also on a new prototype board that’s still in the early stages of development and testing, so within a month or two there’s a good chance he’ll be back on top. Jake also had to push past Paul Jackson (Jacko and Jake push each other every morning in their local training squad) and local dark horse Steve Morrison. To cap it off, Jakie was paddling a 23 inch wide board (the Naish LE14). With the messy conditions most paddlers were struggling to stay afloat on boards that were 25-28 inches wide, so considering how narrow his board is, Jake’s performance was even more impressive. 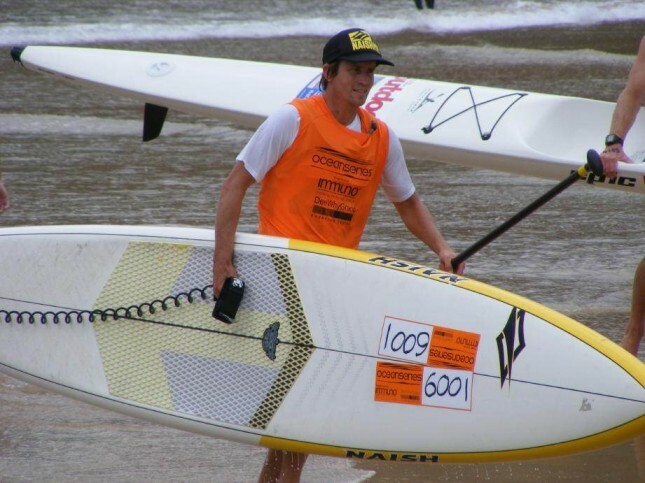 Great finish to the year for the young Naish team rider, and as you can see from the interview below, Jake is already looking ahead to the big SUP races of 2013. On the women’s side of the race Neelie Brown took the win (and the overall Ocean Series title) a couple of minutes ahead of Alison Fullagar. Ali’s race was quite remarkable though; she was stuck in the shorey for 20 minutes and totally missed the start of the race, yet fought her way back through the field and almost stole the win. 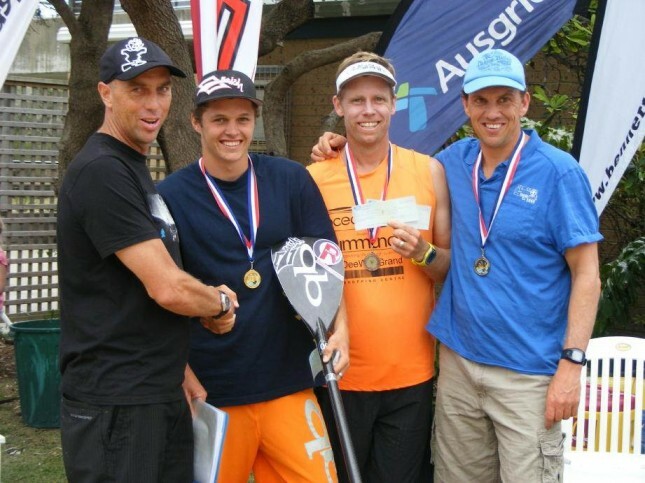 Today’s 20 Beaches race also stepped up the Queensland vs. New South Wales SUP racing rivalry; There wasn’t just $5,000 (plus a few airfares to Perth) on the line, there was also the all-important interstage bragging rights up for grabs. 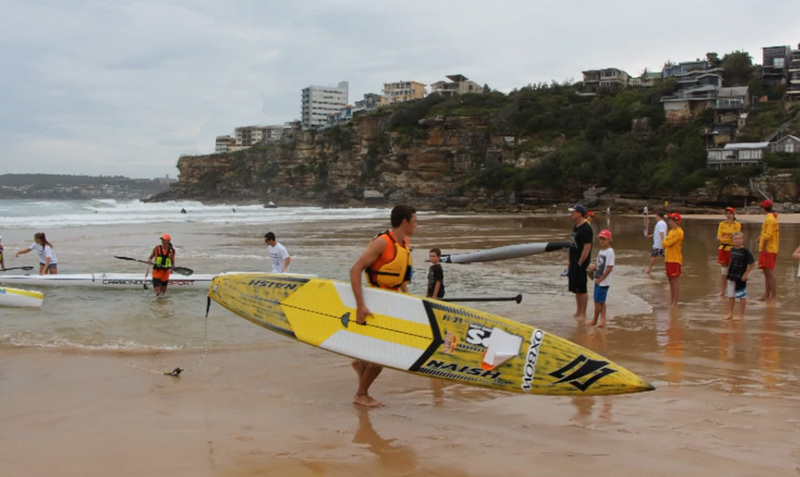 The majority of Australia’s best stand up paddler racers come from either South-East Queensland or Sydney, so this year’s 20 Beaches was billed as a QLD vs. NSW showdown. On one side stood Sydneysiders Dave Kissane, Sam Parker and Steve Morrison, while in the other corner Gold Coasters Travis Grant, Jake Jensen and Paul Jackson were leading the charge for Queensland. In the end, Queensland’s young gun Jake Jensen flew back North with the bragging rights, though overall it was a virtual tie as Dave Kissane and Sam Parker filled the podium for New South Wales, finishing ahead of Paul Jackson and Travis Grant. Despite the tricky conditions this was a great race. Big thanks to Dave Kissane for organising the event and to Starboard Australia and Sam Parker of Wind Surf ‘n Snow for putting up the cash and prizes. I’ve also gotta thank Fanatic for the last-minute loan of the board and paddle, which served me very well. The 25 inch wide, 14 foot long Fanatic Falcon that I paddled for the first time today somehow survived the choppy waters to deliver me a decent result. To see how everybody else fared you can check out the full 20 Beaches SUP race results below. There’s a few slideshows that show just how tough the shorey was (which paddlers had to negotiate before they even got to the start line) as well as some mid-race action: 20 Beaches slideshow #1, slideshow #2, slideshow #3.